On Wednesday, December 12th, Hardwell will be hosting a special Revealed Recordings night at the BE-AT.TV Studio in Amsterdam. This exclusive show will be streamed live via multiple cameras from 8PM (GMT+1 / 3PM EST) to 12PM (GMT+1 / 7PM EST) and brings you exclusive sets from Revealed residents Dannic, Dyro, Firebeatz, JoeySuki, Jordy Dazz and label owner Hardwell himself. 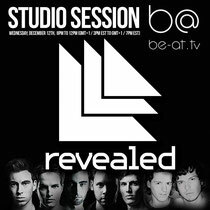 The entire evening will be streamed live from the BE-AT.TV website but also on Hardwell and Revealed Recordings Facebook and includes interviews with residents, guests and gives you the opportunity to get in touch via Facebook and Twitter, using hashtag #revealedtv, to ask questions which will be discussed in the live broadcast. Dannic and Dyro will give viewers a preview of the recently released 'The Sound of Revealed 2012'. This double CD, mixed by Dannic and Dyro, who each mixed a separate CD, consisting of Revealed releases from 2012. The official release of ‘The Sound of Revealed 2012' will be at the release party at Night Rooms, Dortmund (Germany) on December 14th. The evening will be broadcasted from BE-AT.TV’s newly opened studio in Amsterdam. Everyone loves what you guys tend to be up too. This type of clever work and exposure! Keep up the amazing works guys I've included you guys to our blogroll. Do you mind if I quote a few of your posts as long as I provide credit and sources back to your website? My blog is in the very same niche as yours and my users would certainly benefit from some of the information you provide here. Please let me know if this alright with you. Thanks! A motivating discussion is worth comment. I think that you should write more on this topic, it might not be a taboo subject but generally folks don't discuss these subjects. To the next! All the best!! That is a good tip especially to those new to the blogosphere. Brief but very accurate info� Appreciate your sharing this one. A must read article!